I can't remember where in the set, but they definitely played "Hearts" at this show -- it's the only time I ever saw them do it live, and I remember it quite vividly 'cus I always thought that would be one of those songs that I would die without ever hearing in concert. This was a horrible evening from the get go! The day prior to the show I loitered around The Four Seasons Hotel (The band's preferred accomodations) and met Tony and Chris several times throughout the evening. Spent a large proportion of the day drinking in the lounge and chatting with a British fella who later informed me he was their tour manager. Awesome! He gave me pre-show, meet & greet passes for the show the next day. Show Day. Piss pouring rain all day and was unable to get out of work as early as anticipated. Got a ride with my sister to the show and we got stuck in horrible Highway 400 traffic. Get to the show with minutes to spare and then turned away at backstage gate as the band was now in "showmode". Meet up with friends and drank a smuggled in Mickey in record time and take our seats. The place was 2/3rds empty and damp to boot. I realized then that the glory days were over. No more arenas and stadiums. I felt sad like it was the end of an era. 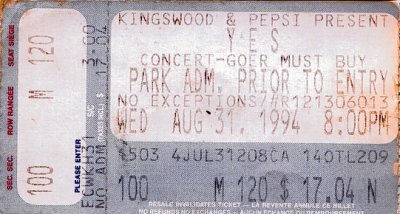 I didn't get into Yes until 90125 but had seen some 15 show to that point. Funny thing though was that the show itself was tremendous. The sound quality was great, the setlist was a little more imaginative and Jon's voice was better than ever. To this day I feel Talk is one of the greatest produced and sounding albums going. This was the low point of my Yes concert career. The crowd was embarrassingly small. The band looked like they were sleepwalking throughout the songs. Rabin for the most part looked and played very uninspired. The "Talk" album was flat out lame and a huge disappointment. To make matters worse Trevor played a piano solo while Tony did little if anything and "Endless Dream belonged in one of Trevor's movies, certainly not on a Yes album. Thumbs down.......Way down. I remeber that the newspaper didn't announce tickets going on sale until the day they went on sale, they usually give you two days notice. There were only about 5,000 people there, I think Emerson, Lake & Palmer drew more a few years earlier. It rained that day and may have kept people off the lawn. The show was okay, at the time it was my 12th Yes show, my friend said it was the best show he has ever seen. I could not get excited for this show, the album Talk is very bad. I have tried for hours on end to like it but it is not a good album at all, with the exception of The Calling which I think is one of the best songs since Tormato.